For the high-tech crowd out there, a new iPhone app aims to put a planetarium on your phone! Star Walk, by Vito Technology, is a planetarium simulator that runs on the iPhone or iPod Touch and can be purchased at the iTunes App Store for $4.99. Recently, I was contacted by Vito Technologies about an evaluation version of the application. Although I don't personally own an iPhone, many of my friends do. Luckily for me, one friend let me borrow his iPhone for a few minutes to try out this new software. Below, I've written a review from the time I spent testing the software. First impressions are important in many things, and here, Star Walk did not let me down! The first thing you notice when you start this app is that it asks permission to find your current location. I guess this is commonplace in iPhone apps any more, but it surprised me how easy it was. I simply clicked "Yes" and the iPhone triangulated my position via cell signal and adjusted the star field accordingly. On the more advanced iPhone 3G, it uses GPS navigation to find your location for an even more accurate fix! Below, you can see the screenshot of this step, and it's approximation of my position. I'm in Youngstown, OH, so you can see that it is very accurate! As cool as that was, Star Walk has more to offer. After completing the location setup, the star field comes up, in typical iPhone quality, full of color and smooth movements. 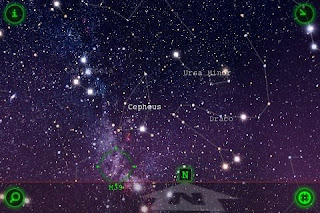 Moving and rotating the star field is accomplished by dragging one finger across the screen, while zooming in and out utilizes the iPhone's Multi-Touch interface. Star Walk includes many objects, including the Messier catalog, planets, and meteor showers. Below you can see the interface. I have M39 highlighted to show that part of the interface. After a few minutes getting used to Multi-Touch (I'm not a native iPhone user) I found navigation to be quite easy and intuitive. When you select an object, there is a button in the corner of the screen with an 'i' on it. 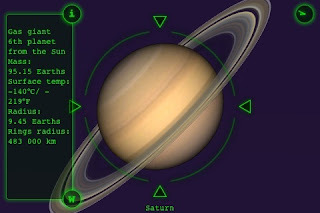 Clicking this button gives you information on the object, as shown below demonstrated with Saturn. Star Walk has information such as this for everything that you can see in the display. The coolest thing I noticed here is that if you click the button with a 'w' on it, it takes you to the Wikipedia page for that object! Also, you can change the current time using a touch-friendly interface. This is useful for simulating future and past events. This is especially useful when you want to, for example, figure out how much the Moon will interfere with the next meteor shower. Star Walk also includes a "night mode" (shown below) that changes the screen to dim shades of red that preserves your night vision for use under the stars. After only a few minutes testing this app, I would say it is a must have for amateur astronomers. The interface is easy to use and useful. The inclusion of a night mode is a serious plus for this software. 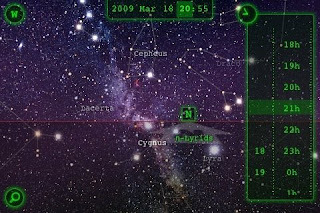 Overall, Star Walk reminds me of a mobile version of Stellarium, albeit with better graphics and user interface. If I had an iPhone, I would definitely be purchasing this app, especially since it's so cheap at $4.99. The only thing that I found issue with in Star Walk is the fact that it doesn't render the positions of planets' moons. This would be a very valuable feature, and would hopefully be added in future versions. The other features of this program, however, are valuable enough to make this app a great buy! In short, I recommend this app to all iPhone or iPod Touch users with a curiosity about the night sky! Click here to download Star Walk from the iTunes App Store. NOTE: I receive no compensation, monetary or otherwise, for the publishing of this review. Thanks for the review. It is timely as I am considering a planetarium program for my iPhone. 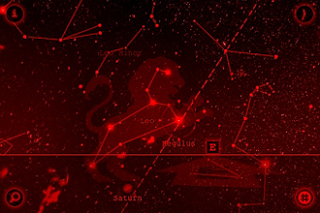 Find 9 Easter Eggs in the night sky of Star Walk and get an iPod Touch for free. Or find at least some and get iTunes gift card! I got the application before starting some viewing for http://www.100hoursofastronomy.org and found it very easy and fun to use. Nice review! Does anyone know if you can return directly into the app from a wikipedia link? I can't figure out how to do that. Star Walk is a great educational tool for anyone interested in astronomy. You can navigate through the stars, through the galaxies, and even travel in time to watch events in the past. I have lost my constellations does anyone know how to get them back?